Home > Categories > Residential Services > Disaster Restoration > Advance Catastrophe Technologies, Inc.
At Advance Catastrophe Technologies (ACT) we are here to serve our clients in their time of need. We provide 24-hour emergency response, disaster restoration, and home cleaning services. We understand that when someone calls ACT they need help in dealing with an unexpected disaster. We believe in putting our customers’ worlds back together. Whether it’s a straightforward carpet cleaning job or whole house mold remediation, we treat the project as if it were our own home or business. We strive to alleviate the concern, worry, fear, and pain that our customers oftentimes feel. To us, it’s not just a job that needs to be done. It’s really about people, their families, and their lives. 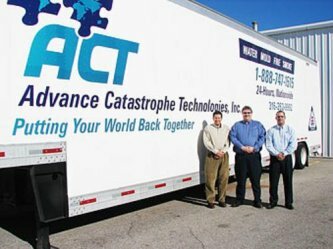 At ACT we use a proactive approach to mitigate disaster while educating businesses and homeowners alike about disaster planning, fire, water, storm damage, and mold remediation. We possess the credentials, knowledge and equipment capabilities that can’t be matched in the areas we serve. ACT is proud to be certified by the Institute of Inspection Cleaning and Restoration. Call us today at (316) 262-9992 or fill out our form for immediate service you can rely on! Download the ACT App Today!